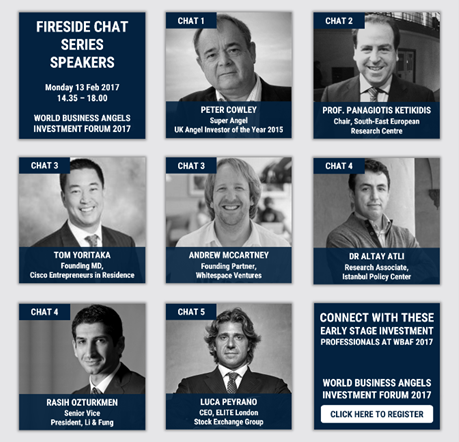 Building on the success of the first World Business Angels Investment Forum (WBAF) in 2016, this year’s forum, with the theme of ‘Partnering with Corporate Ventures from Start-up to Scale-up to Exit’, will focus on how corporate businesses can foster open innovation and deliver more business value through partnerships with angel investors, start-ups, and SMEs. In Fireside Chat 2 Prof. Panayiotis Ketikidis, co-Founder of HeBAN and Chairman of South-East European Research Center (SEERC), will discuss about “The Science of Success: The Altuntas Start-up Compass Theory”. Many universities have developed their business programme curriculum and the teaching of entrepreneurship methodology to align with the Startup Compass Theory, which proposes nine steps an entrepreneur has to consider: from wannapreneurship to innovation, on to entrepreneurship and marketing and sales, and then to branding to institutionalisation and franchising, finally progressing to leadership and angel investment. While the inclusion of this approach in educational programmes and workshops attests to its success, it has only recently been evaluated and scientifically validated. In this fireside chat, Prof. Panayiotis Ketikidis will present findings about the applicability of the Startup Compass Theory. Εάν ναι, πατήστε στην παρακάτω εικόνα. HeBAN is the Greek National Member of EBAN (European Trade Association for Business Angels, Seed Funds, and other Early Stage Market Players). HeBAN is the National Lead for Greece of GBAN (Global Business Angels Network).